The great Keith Parkinson has been featured several times on the blog, and he will most assuredly be featured again in the future. He left a wondrous legacy of fantasy and science-fiction art behind after passing from the world too soon in 2005, and it remains a testament to his talent. This piece done in acrylics for the 1987 DragonLance calendar: a tour de force exhibition of TSR’s exceptional bullpen of artists at the time. Published when the company’s prosperity was nearing its zenith, it also contained artwork by such notable contemporaries as Jeff Easley, Larry Elmore and Clyde Caldwell. Many pieces had been or would be reused by TSR elsewhere for covers and ads. To my knowledge this piece from Parkinson only appeared as the latter and as interior art, in addition to being in The Art of the Dragonlance Saga. I like this one for several reasons. The landscape and snow is done with realism and detail, this could be the woods behind my house during any winter storm. 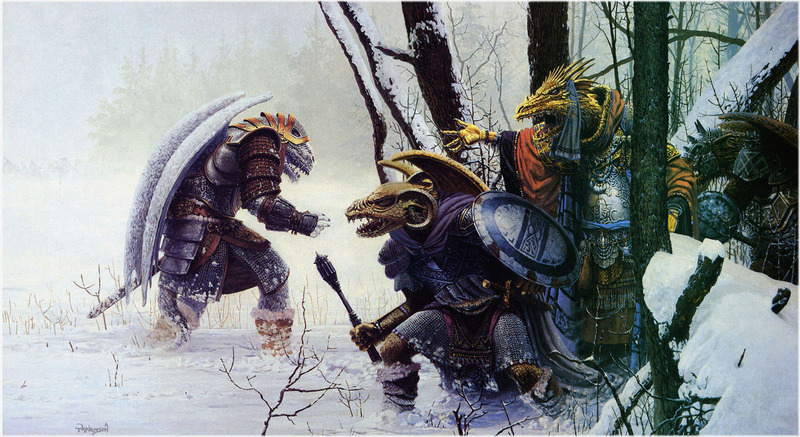 And although the figures are clearly fantastical —they are, in fact, Draconians which are a famous part of the DragonLance setting— their clothing, weapons, and armor are realistically done. This really adds to the strong quality of immersion the piece possesses. I’m also not a fan of impractical arms and armor, so it scores double points with me from that. There is also its humor. It’s rare to find fantasy art where the joke isn’t exaggerated and slapsticky. Not that I don’t like that —in fact I do— but I can appreciate a drier wit that keeps its tongue in cheek as well. The way that Parkinson can relay the frustration of the leader chewing out his group of lesser villains is great. I can just imagine the sass coming from his scout in the snow, and can hear the sounds of all four bickering under a winter wind. Great blog post, made me feel good inside. Dragonlance got me into fantasy and I collected a ton of the artwork. I think DL had some of the best fantasy art, period. So glad you enjoyed! I love digging up the classic fantasy art of my youth, and appreciating it with older eyes. DL definitely had some of the best art of the era, and the books have had a really wide influence on the genre that has been shamefully overlooked. Many great stories between that beautiful cover art!